Found this on the laptop and thought I would share it. This is some type of Swallowtail Butterfly, though I do not know what type. I had thought Tiger, but... it sure looks too white and the markings don't look exactly correct. 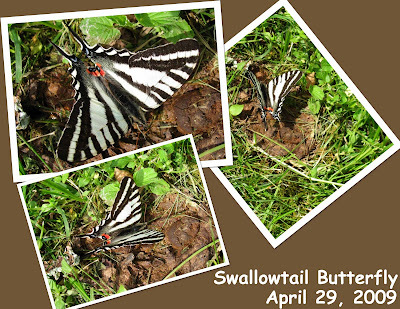 If you have any idea what variety of Swallowtail this is.... please let me know. How about the "Scarce swallowtail" I. podalirius. Is it a Zebra Swallowtail (Eurytides marcellus)? Clearly, YES!! Yea that is it "Zebra Swallowtail - Eurytides marcellus"